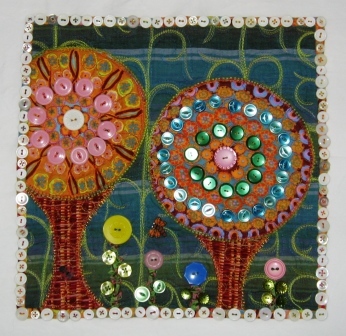 This is Button Trees my entry to the Edmonton and District Quilter's Guild Challenge also called the Wild Rose Quilt Show. The little quilt was to be 12 inches square. Way back in March I had been working on the little quilt but made the quilt the wrong size. I almost gave up. Here is the link to the post. Now that the challenge is done and the quilt is home I can finally show you my quilt. A friend said "Who does not like buttons". 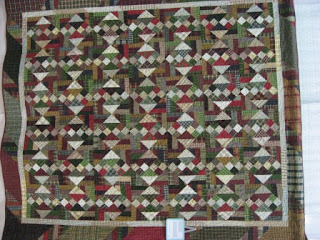 This is Brad's plaid quilt - side ways again. (And now I have Bold and can not get rite of it. ) 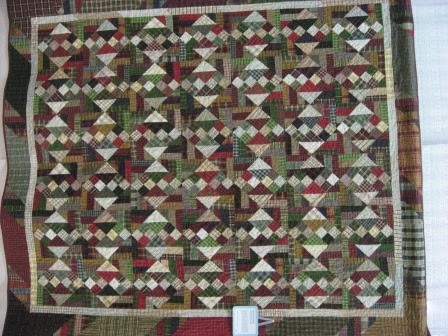 I had this in the quilt show. I had pinned a sleeve on the quilt to hang and the quilt is well used already so it is not hanging very well. I hate it when the quilts look all wavy. When my quilts are new I do not have this trouble but now that it is well used it hangs funny. Maybe it is the sleeve - pinned not sewn by hand.